As an applicant, all information you share about yourself will be kept confidential. NYS AHEC is required to report general demographic information about participants in the categories within this application. This data will be confidentially maintained and will be referenced periodically to evaluate the effectiveness of AHEC services and programs. We appreciate your cooperation in the completion of this form. 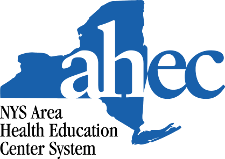 Why you would like to participate in the NYS AHEC Scholars program? How will the NYS AHEC Scholars Program benefit you in accomplishing your academic and/or career goals? ❷ Letter of Recommendation: Stories about your behaviors, impact, and personal qualities told by others play an essential role in the evaluation of your application. Your letter of reference should provide specific examples and anecdotes that illustrate your ability and desire to be an AHEC Scholar. Please attach one letter of reference from a teacher, faculty member, community leader, mentor, etc., and provide your reference’s contact information. NOTE: If the person who is writing your Letter of Reference would rather send the letter directly, please upload their Name and Contact information instead of the actual letter. The completion of this application is estimated to take 8 - 10 minutes.